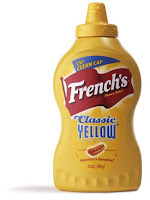 Frugal & Fabulous: Free or Cheap French's Mustard! Free or Cheap French's Mustard! Print this .50 off coupon and assuming the coupon will get doubled, your mustard will be free! **Or buy it at CVS on Sunday 5/25 or May 5/26 (2 day only sale). It's on sale for 66 cents - 50 cent coupon= 16 cents!